Governments tend to be the largest generators, collectors and users of data. We want to make this information more easily available to the public to increase transparency as well as create solutions and applications - driving innovation for economic and public good. 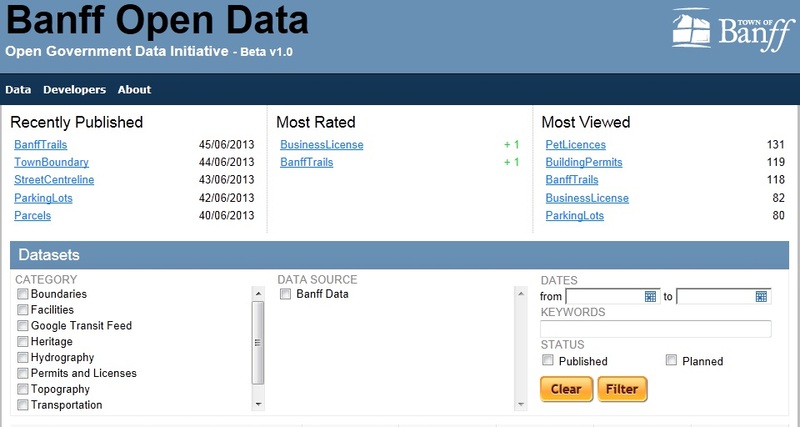 Open Data is Town of Banff datasets freely accessible in machine-readable formats with no restrictions in licensing or copyright. New datasets are added on a continual basis and existing data sets are updated regularly or as needed. Open Data is not about sharing personal information or details with the world. The Town of Banff is governed by the Alberta Freedom of Information Act (FOIP) which controls the type of information that a government can share. We take FOIP Act seriously and will never disclose personal information without an individual’s written consent. Check out the Town's interactive Open Data Catalogue modeled after existing, successful Canadian Open Data catalogues. This catalogue allows you to search for and view existing Open Data sets. You can view tabular data, download data to Excel, view data on a map or view data in Google Earth. Application developers can connect directly to the Open Data sets and use them as data ‘feeds’ or sources for their applications. Looking for Open aerial imagery of Banff? Check out our Imagery/Orthophoto page to select one or many of our 2012 aerial imagery tiles. Data sets are automatically updated on a nightly, weekly or yearly basis depending on source data update frequency. More data sets will be added, and we encourage the public to comment on existing data sets as well as recommend additional data sets. The Town’s Open Data license agreement is flexible and modeled after existing Canadian Open Data agreements. Are there datasets you would like to see listed in the Town of Banff's Open Data Catalogue? To request the addition of specific datasets or to submit comments or suggestions, please contact Banff Open Data.